It has been on my radar for some days, Bob. Another great one Baz. Keep 'em coming! I love those pin-up girls on bombs. Great picture Barry! I love Lancasters. Great pic but she won't be taxiing anywhere until someone takes those chocks away ! Look forward to seeing her take to the skies one day. 'Just Jane' getting ready for her night time romp? Bombs away! I have to make some time to finish up my night rules for WW2. Here is a great pic of "Just Jane" taxing at twilight. 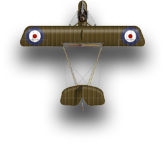 Official Pfalz D.III painting thread. Hangar decks similar to the hanger trays.